The cloud mining service ZeusHash has started a new promotion for users of the service giving them the chance to get some HashBuffs that may give users of the service some boost in profitability. 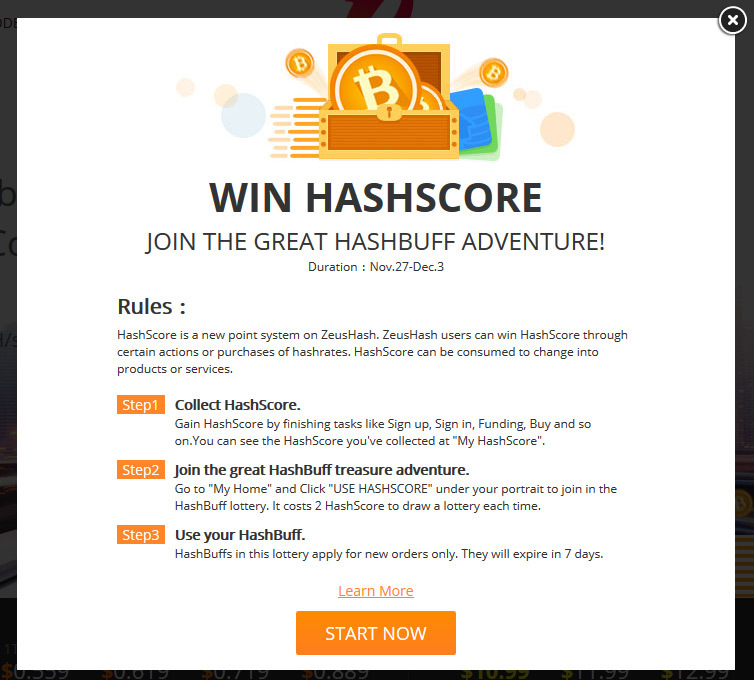 The new promotion is for collecting HashScore by doing various things and then you can redeem the collected HashScore for HashBuff upgrades. The promotion will run from today November 27th until December 3rd and the HashBuff upgrades you can win during this time via HashScore apply for new orders only and if unused they will expire in 7 days. The way we understand this is that if you for example win a 1 Day double payout and you activate it you will only benefit from it only if you also purchase some hashrate after you activate, it will not double the payout for the hashrate that you already own, the same should also apply for the zero maintenance fee HashBuffs. The only more interesting HashBuffs that should give you a nice advantage are the 5 GHS and 100 GHS extra hashrate, but these are probably the hardest to get and they still need a new hashrate purchase to be activated and the bonus hashrate to be credited to your account. We have tried the HashScore lottery already just out of curiosity as we’ve had some points in our account, so we’ve decided to spend them and thus try our luck. The result from 6 tries to win HashBuff upgrades were 1x 5GHS Extra Hashrate, 2x 1 Day Double Payout and 1x 1 Day 0 Maintenance Fee. Do note that you need to actually activate the won HashBuffs in order for them to do what they are giving you as an advantage and you have 7 days to do so or you will loose them – this means you need to make a separate purchase of hashrate for each and every HashBuff in 7 days after you’ve won it. The funny thing is that when we try to directly activate our 5 GHS Extra Hashrate HashBuff it does nothing, we neither get extra hashrate, nor we get the HashBuff marked as used. After a bit of digging we have found out that even the Extra Hashrate HashBuff upgrades do require you to purchase new hashrate in order for them to be applied, just like all the other HashBuffs do. We can say that ZeusHash has been quite active lately in trying to promote their cloud mining service via various promotions like the latest one, and although these could add something fun to the cloud mining thing and engage users, the end result is not so good. What the ultimate goal of all these things is to bring more people to the service and to sell them more hashrate, either for Bitcoin or Litecoin cloud mining. However these do not seem to work pretty well and the actual reason for that is the not overly attractive prices for hashrate, combined with the high maintenance fees that result in pretty low actual profit. Unless that changes whatever clever or fun promotions the service thinks of it will probably not attract that much new users that will be ready to invest into hashrate. – For more information about the latest HashBuff promotion running now on ZeusHash….